This summer I received one of the funnest surprises in the mail – this gorgeous vintage quilt from my friend Cathy in Kansas. She makes quilts for people who really need them and I offered to send her some fabric for her good cause. In return she asked me if she could send me an old quilt that she had. When the quilt arrived, I about died! It was so gorgeous and in amazing condition. I laid it on my floor so I could look at it while I worked that day. The pattern is Kansas Dugout and it is hand quilted, and probably hand-pieced. (Red Pepper Quilts has a free Kansas Dugout tutorial if you’re feeling inspired.) My best guess is that it’s 1940’s-50’s. (Feel free to weigh-in if you have an opinion.) I finally took it out to get some pictures a couple of weeks ago when I shot my Hadley quilt. I love looking at the individual vintage fabrics. I think one of my favorite parts of old quilts is that the fabrics are so scrappy and random – not matchy-matchy at all – because they were legitimate scraps leftover from everyday sewing. And the effect is so great. Also, many of the vintage fabrics are really quite “modern” – check out that turquoise and chartreuse dahlia in the middle on the left. I’d love some of that one! I think this picture is my favorite. I’m still a little blown away at Cathy’s generosity. This quilt is such a treasure. So I thought it would be a perfect thing to share in honor Thanksgiving today. I have witnessed many generous acts over the past year that have touched and inspired me – most of them done privately and unselfishly. I guess I’m choosing this quilt as the symbol of that kind of love and generosity. It’s amazing to see the ripple effects a kind and loving act has on so many people. 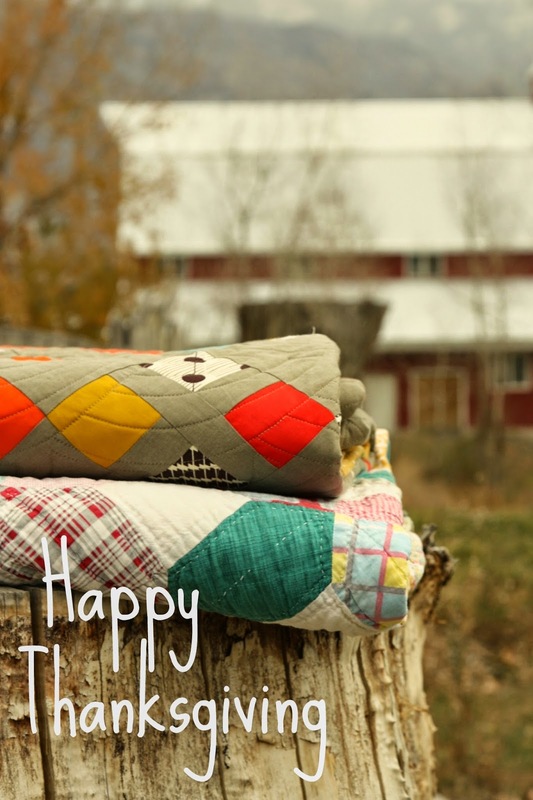 Beautiful quilt and a wonderful post on gratitude. Happy Thanksgiving. Beautiful quilt<br />I&#39;m running a fabric giveaway, would you like to enter?<br />Happy Thanksgiving!! Thank you for these beautiful pictures of the vintage quilt. It reminds me of two that my mother made with her loving hands – to use up left over scraps from years of &#39;projects&#39;. Also thank you for the message at the end. I love those reminders – to stop and reflect and be THANKFUL!! Thank you Amy! Beautiful quilt and such truth in your gratitude quote, Happy Thanksgiving! Thank you so much for sharing. I love the pic with the beautiful mountains in the background. Putting on the attitude of gratitude – Happy Thanksgiving to all! The vintage quilt is gorgeous. Best gift too. Just goes to show you – everything old is new again. I&#39;m with you on loving the lack of &#39;matchy matchy&#39; and it&#39;s so great that this beauty has gone to a home where it will be loved and treasured. Happy Thanksgiving, indeed. Great post! That quilt is wonderful…I love old quilts, too, for all the different fabrics and imagining who made it. What an amazing gift! Gorgeous quilt. Happy Thanksgiving to you. Such a beautiful quilt, I always think of the fingers working that material and the time it took to finish, what she was doing while quilting. I am a machine piecer and hand quilter. The love that goes into each stitch of the quilt is hopefully never forgotten. Thank you so much for sharing such a wonderful story on the day of blessings. Happy Thanksgiving to you and yours. We could all benefit from your wise quote! I hope you and your family had a Thanksgiving filled with love and blessings. <br /><br />The quilt is a generous and beautiful gift – and I&#39;m sure it warms her heart to know how much you appreciate it. That is always the best gift to give in return! Thank you for sharing the quilt and the message! Such a beautiful gift from a treasured friend! The quilt is absolutely gorgeous. I always think about the hands that made it – what was the person thinking about? What was their life like? Was she dearly loved? Thank you so much for this post. As Junior Asparagus says, “A thankful heart is a happy heart!” Happy day of giving thanks!